Pat Simmons, left, and Tom Johnston of the Doobie Brothers rock the BB&T Pavilion in Camden, N.J., on July 21, 2017. First things first: Let’s just put the Doobie Brothers into the Rock and Roll Hall of Fame right now. It’s long overdue. Waive whatever rules there all and just pencil the band in to accept the designation and perform at the next induction ceremony. This is not a new thought, but it certainly was reinforced Saturday, July 21, when the Doobies shared the bill with Chicago (2016 R&RHOF inductees). 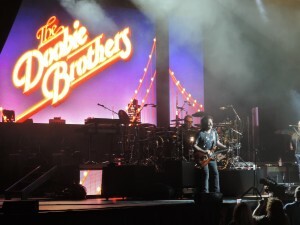 Simply put, the Doobie Brothers rocked the roof off the BB&T Pavilion in Camden, New Jersey. They’re just that good. 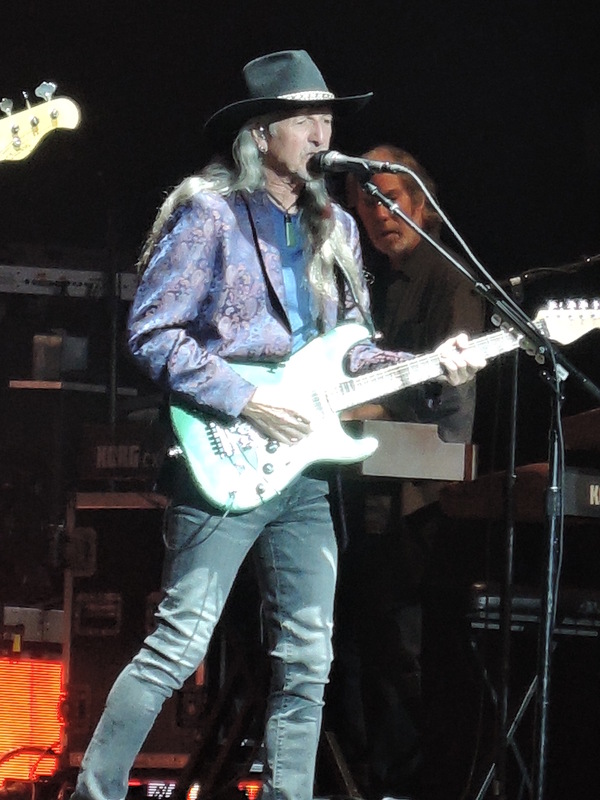 The 15-song set was heavy on the early Doobies, with 13 of the songs coming from albums recorded between 1972 and 1975 – Toulouse Street, The Captain and Me, What Were Once Vices Are Now Habits and Stampede. That was fine with me. Those were the years that I listened to a lot of Doobie Brothers. I was a sophomore in high school in 1975 in central Illinois and every day during lunch period, I’d pop a quarter in the school’s juke box and play two songs: “My Maria” by B.W. Stevenson, the title cut from his 1973 album; and “China Grove” by the Doobie Brothers, off the 1973 album The Captain and Me, the making of which was featured in the first volume of The Vinyl Dialogues based on interviews with the Doobies’ Tom Johnston and Pat Simmons. 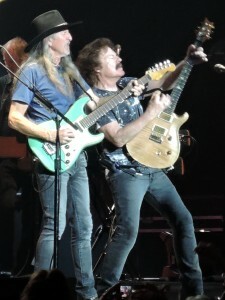 Johnston famously had to leave the Doobie Brothers at the end of 1974 because of health issues associated with the rigors of a band that was on the road quite a bit. Because of that, Johnston was unable to join the tour in the spring of 1975 to promote the Stampede album. Steely Dan guitarist Jeff “Skunk” Baxter, who had joined the Doobie Brothers after Donald Fagen and Walter Becker of Steely Dan retired from the road in 1974, proposed that songwriter and vocalist Michael McDonald, a fellow Steely Dan alum, fill in for Johnston on the tour. What was next was that the Doobie Brothers had come to a crossroads. To that point, Johnston had been the band’s primary songwriter and now he was unavailable. So the band turned to McDonald for material to supplement what Simmons was writing. The result was the 1976 album, Takin’ It to the Streets. And it marked a radical change in sound for the Doobie Brothers. “A door opened rather suddenly with the Doobies. Those guys were so open to anything I had to offer and it caught me by surprise, really,” said McDonald. “I did not expect that having come from another situation with Steely Dan, where Don (Fagen) and Walter (Becker) were the sole source of all the material. I had learned a great deal from them, however. That was probably my whole songwriting education in a way. I grew up writing songs, but it was a real crash course to learn a different approach to arrangement, chords, melody, that I got from working with Donald and Walter. There are some factions of the listening public – real or perceived – that are divided about the different versions of the band. There is the Tom Johnston Doobies and the Michael McDonald Doobies. What we saw Saturday night in Camden was definitely the Johnston Doobies, as they have been for a while now, with a nod to the McDonald years. McDonald’s “Takin’ it to The Streets” was included in the setlist. “A lot of people have thrown credit to me for the evolution of the band and changing the complexion of the Doobies’ music. Although I had a part in that, it wasn’t totally me,” said McDonald. “It was really a lot of things that happened. One, Jeff Baxter was a big part of the music changing and bringing me into the band even. The arrangements of our songs and his guitar style and jazz influences brought a lot to the band and to my songs. The contributions of Pat Simmons to the band also have been significant and shouldn’t be overlooked or downplayed in the least. He’s been the only constant from the band’s inception through the transition and back again. 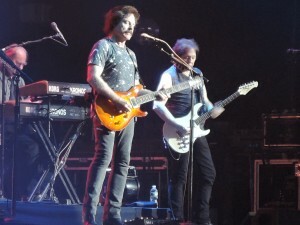 He and longtime bandmate John McFee co-wrote another of my favorite Doobies’ songs, “Far From Home” from the 2010 World Gone Crazy album. 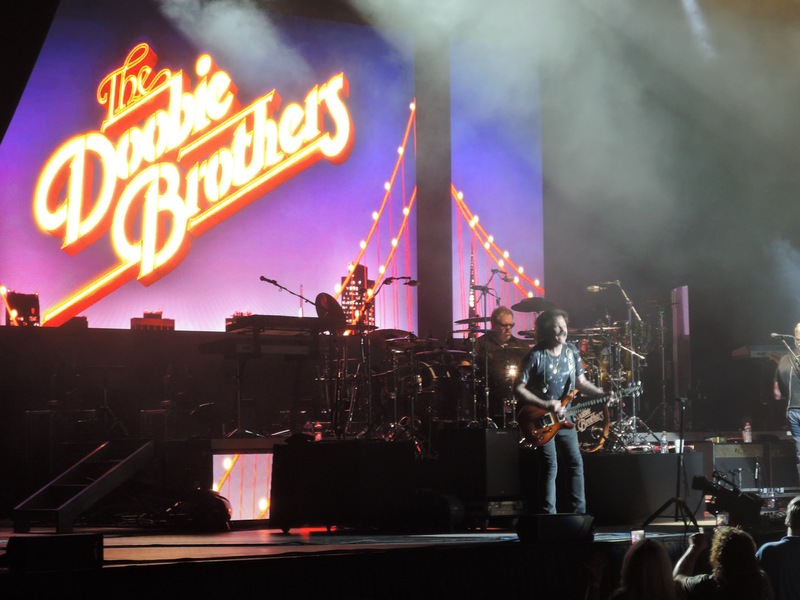 Through it all, the Doobie Brothers are still rockin’ down the highway. And it’s time they get the proper recognition. The Rock and Roll Hall of Fame should take note. Great read as always, Mike! I am also a fan of the Tom Johnston era Doobies but I AM partial to the Micheal McDonald era Doobies as I was in middle school when “Takin’ It To The Streets” came out. Along with the title track, “It Keeps You Running” is my fav from that great album. Of course my favorite Doobies album is “Minute By Minute!” All of those songs hold special meaning to me as that was when I was in high school and played it when I was at lunch on my tape player! Another underrated LP is the next one,”One Step Closer” in 1980. I know Tom and Michael have worked together on Doobie projects but I would have loved to have heard them collaborate on an album together with the group. That’s great! Tom Johnston, Patrick Simmons and John McFee make a formidable group together, Mike!